After saying I wasn't playing earlier this week, I decided to make a last minute entry into the Weekly Bake Off. The main reason being that because I was a complete and utter numpty on Friday night when I was making marmalade and used up an entire bag of caster sugar, and then didn't replace it when I went to Sainslebob's this morning, I couldn't make the rhubarb and almond loaf I'd planned for today. My work colleagues will be disappointed tomorrow! So how did I manage to make a cake without sugar? Well mes amis, I made today's entry with Xylitol. And very nice it was too. What's Xylitol, I hear you cry? Well it sounds like some nasty chemical sweetner, but in fact it's a natural sugar substitute, extracted from the skins of fruit and vegetables. It is used in many 'sugar free' products and is a marketed as a good alternative 'sweetener for those with diabetes and hyperglycemia'. It has a lower Glycemic Index (GI) than regular sugar, coming at 13 for Xylitol vs 60-65 for standard sugar meaning the familiar cake sugar rush is more subdued. It also has roughly one-third less calories than normal sugar, making it a good option for dieters. I'd been aware of its use in things like sugar-free gum and mints, but never realised that it was a totally natural product until I read about it being used in cakes on the BBC Good Food website the other day. The husband is diabetic and has the world's sweetest tooth. Sweet stuff causes him all manner of problems which is why my work colleagues are treated to my baked goodies so often. So I decided to buy some Xylitol and give it a go. It's not cheap at £2.79 for 225g - enough for one large cake because you literally substitute it gram for gram with sugar. I've tried baking with fruit sugar before with mixed results so I was naturally a little sceptical for this cake, but in the spirit of trying new things, I went ahead. And I was really pleased with the final cake. It rose just like it should - it was helpful to see the other bake off entries to confirm I had a comparable rise. As for taste, I found the cake a little sweet but that could just be the way everyone else's cakes are anyway. I would've liked my apples a little tarter - but you can't control that in a cake. All in all, a pretty good cake. Not sure how it would be cold, but it's great slightly warm with creme fraiche or ice cream. Just the thing to have after a big fat Sunday roast dinner - but in our house, it came after the usual chicken tikka. Not had the husband's verdict yet. He announced earlier, in total seriousness, that the rice krispie cakes that I'd made with Miss A this afternoon were far nicer than any other cakes I've ever made. Miss A wasn't even round at the time so it wasn't like he was paying her a compliment. Whilst I have a soft spot for krispie cakes, there really is no accounting for some people's tastes. Another reason why my work colleagues often get cake - they're so complimentary. 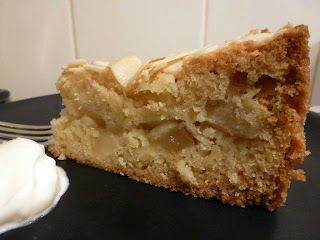 Another good bake - but then it's from Dame Mary Berry so why wouldn't it be?? Updated - 13th Feb 2012 - Just a side note on the xylitol thing. Apparently (I now have proof of this) it can cause a bit of belly-aching if consumed in large-ish quantities. This only happens in a small percentage of people and apparently disappears over time after the body becomes used to it. The husband was absolutely fine on that score so it's obviously just me. It's also not good for dogs and can cause hypoglycemia in them so make sure you don't leave your cake where your four-legged friends can partake of a slice or several.